If you’ve ever printed anything at the printers in the alcove, you may have noticed this print. At first glance, it’s a blur of brown blocks with swashes of blue and red and green mixed in. It’s not until you focus on it do you see people bent over books and newspapers, reading and studying. Some even look like they’re napping. It’s actually a common scene when you wander through the library on a Monday afternoon. Most every chair is full, and people are struggling to maintain concentration or furiously write a paper. Jacob Lawrence is one of my personal favorite artists. I took an African American Art class as an undergrad and was really captivated by his work. He would create a series of paintings (included 30-40, even 60 pieces) that would tell a story, most about people or events significant to African American history. They included Toussaint L’Ouverture, Frederick Douglass, Harriet Tubman, life in Harlem, the post-World War I migration, and the civil rights movement of the 1960s. 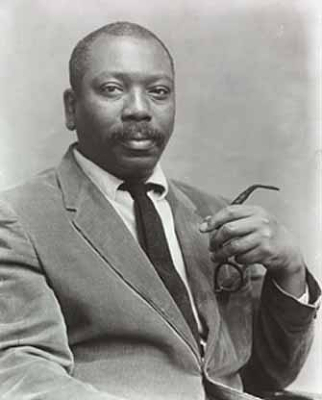 Jacob Lawrence, Originally photographed by Geoffery Clements. Featured on the Smithsonian American Art Museum website. Born in Atlantic City in 1917, he moved with his family to Harlem in 1930. He started taking art classes as a teenager at the 135th Street Branch Library. His skills and talent developed, and he became a key player in the Harlem Renaissance, mingling with other greats like Langston Hughes, August Savage, and Aaron Douglas. He secured a position with the WPA Federal Art Project which helped him through the Depression. He continued to paint, teach, and explore the world until his death in 2000. Lawrence dubbed his style “dynamic cubism” and he approached his work systematically. When working on a series, he would complete the preliminary drawings for the entire series, lay out the paintings across the studio, and then paint one color at a time on each piece. Doing so would bring consistency and cohesion to the series. I imagine working this way enabled him to maintain the vision of the entire project without getting fixated and lost on one smaller aspect of the entire story he was conveying. 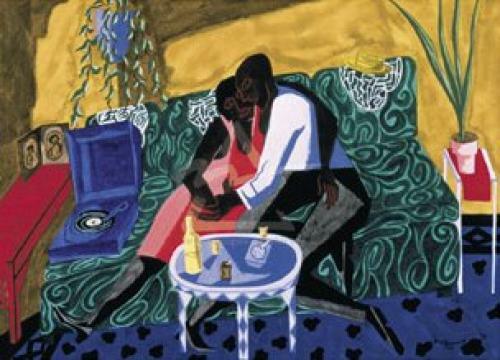 This entry was tagged art, Art in the Library, jacob lawrence, The Library, The Lovers. Bookmark the permalink.